And, many other questions will be answered in this video. The code follows the video. Last 3 days viewed all of your videos and want to say manymanymany thanks for all the effort you’ve put in to this stuff. I beginning to understand things I only dreamed about. I have a WordPress CMS website under construction and thanks to you I made a giant step in the completion of this site. Will let you know when it’s online. Once again thanks for you’re effort and generousity to made this available for the www community. Regards from the Netherlands and a 63 years old follower. It makes me very happy that you find my tutorials useful. I do seem to attract people older than the normal 35 and under crowd. I don’t know why? I never meant for the WordPress tutorials to go so long, but most people that liked them appreciate the fact that I took the time to do so. It’s amazing that people in other countries see my stuff. I don’t travel at all and live a very frugal lifestyle. I plan to cover other areas of knowledge. I want this to be a free college of sorts. I plan to cover electronics, chemistry, microbiology, psychology and of course more programming tutorials in the new year. The fact is that without people like you I would have never continued this project. Your appreciation keeps me going. Well age in my case is’nt a mental thing but more a physical thing. Looking forward to your future updates. i, thanx for the tuts, I’m from Kenya and for once I’m getting da basics of setting up a website,many thanx! Im not sure if my previous message was uploaded as I cannot see it in the reply therefore writing again. Sorry if its sent twice now. Hi David, Sorry I couldn’t answer quicker. I always verify all of the comments don’t use code injection techniques. I have now copied your tutorial EXACTLY as its shown and placed all the code in the right folders and still the menu dropdown doesnt show in my IE. Looked into z-index online and tested by placing it in the css code but still cannot figure out the whole thing. Derek do you have an idea were to put the z-index? Also I have copied the code EXACTLY as its show but why doesnt it work in IE…??????? Search for z-index in your css code. Then play with the z-index value for ul.dropdown ul until it shows up on top. As per why does IE work like this. IE has constantly worked different from every other browser. 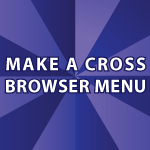 I tested this menu in IE 6, 7, 8, 9, and it worked. If you give something else on the page the same name as I use and then edit that CSS code you can have problems. Believe me I’ve had trouble with IE in the past. This is just part of the learning curve. i have a question, i want to make css3 work for all the browsers, what can i do for this?? is it possible to let all the properties of css3 work for all the browsers (even ie6 also)..
I’m working on a CSS3 and HTML5 tutorial. I actually started it here HTML 5 Help, but I ended it because nobody seemed interested in it. Tell me what you think of that tutorial. Anything I could improve? Truly, you have done a great service for many of us CSS heathens. Thanks at last find some useful knowledge. I was digging google for about 2 weeks and found you on youtube. Thanks alot . You’re very welcome 🙂 I’m glad I could help. Hi Derek. I was wondering, you have 4 separate pages here of code it looks like. I wanted to know you can put that entire thing in the index.html for the website? your vid showed u switching back n forth to several pages and got confused. So is there a way to make that menu all on one page? Hi Jamie, Sorry if that was confusing. I was experimenting with whether it would be easier to understand if it was broken up.